I configured 2 upload servers in phpstorm, one for apache web server, another is for backup. It used to work very well, two servers option could appear when I click "upload to". 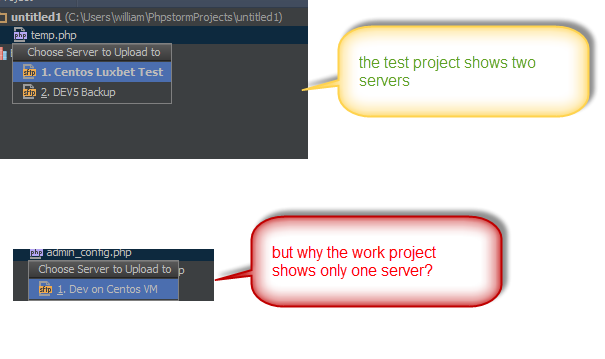 When I create a new test project, the two servers can still be shown. How to make both servers appear in options? When I tick "automatic upload", it appears two servers as option, see the screen shot. Please make sure that it has all fields on Mappings tab properly filled (only Connection tab is shared between projects -- Mappings and other tabs are per project). As you said in the screen shot, the backup server is available for test project. I double checked, the mapping has been configured.